One more active shooter incident, just a different town, different families but we’ve seen this show far too many times before. I’m disgusted that everyone is blaming everyone else, the gun lobby oh it’s a mental health issue, the gun control tribe, oh we need gun control, everyone attacking the FBI and the mental health system. The reality is WE, the collective We, failed. No single agency or group or person or law is solely responsible. Non-sensible gun control, non-sensible mental health laws, non-sensible law enforcement and non-sensible governing by public officials who haven’t displayed even the slightest bit of leadership. Leaders stand up, admit their failures and take actions to correct course. I know it’s only been a few days, so maybe just maybe someone will step up but based on previous track records, I kind of doubt it. If you’re an elected official, we’re calling you out. There is nothing and I mean, NOTHING that is more important than protecting our kids, no … America’s kids. If you think of them as someone else’s kids, then you’re sorely mistaken. These are American’s kids, they belong to all of us. It just so happens that they weren’t my blood relatives – at least, not this time. If you’re a public official you serve us – not your own or your party’s agenda – OUR agenda, and right now our agenda is – SAVE OUR KIDS! I had written a two-hundred-word rant but I think Emma Gonzalez said it much more eloquently that I. This is not about anything other than will power. We, after Presidential leadership, decided to put a man on the moon. Not because we knew how but because that’s who we are. We did it because of our willpower to do it. I fear that in the aftermath of this tragic event those faced with finding solutions; i.e., security companies, elected officials, and school administrators will rush to add security guards and electronic security systems to their schools. Unfortunately, these products will not solve the problem. The school in Parkland had both. Sadly, the guards will be somewhere else when the shooting starts or will become the first victim. More cameras will only allow us to capture what happened, because there is no one monitoring and responding in “real time”. Allowing teachers to carry guns, will not stop the carnage. In fact, the idea of allowing “responsible” people to carry weapons, whether open or concealed, only puts more people at risk. We could add fences and gates and metal detectors but all of those can and will be circumvented by a dedicated threat. Besides, fences and gates and access control add to the issue of aggressiveness. And, I certainly don’t advocate that we turn our schools into prison like compounds. It’s going to take a multi-layered approach. We need to address the possession and use of guns, especially assault type weapons that are designed to kill as many people as possible in the shortest amount of time possible. Since they’re not for protecting a person and or his/her loved ones I don’t get why you need to have one. I understand the argument that you have the right to protect yourself and your loved ones in your home, but do you really need an AR-15 to do that? I’m not writing this to get in an argument over guns. I’m writing this to voice my concern that if we don’t address the use of these type weapons in a logical way, we’re in for more trouble. Regrettably, someone will say, “Hey here’s how we fix this, so it doesn’t happen again”. And then everyone will run after that solution for a while or until the next shooting happens. Then we’ll figure out what “fell through the cracks”, plug that hole and wait for the next killings to occur. Unless we have a comprehensive approach bringing a variety of disciplines to the table the “plug a hole” approach will cost lives. Just like tackling the root causes of what happened in their totality so is the necessity to take a layered approach to implement security at the detection, assessment, command and control (school administration), response and engagement levels. Without a holistic approach we will not have comprehensive solutions. I have to say, that while I detest what the Parkland shooter did, I also can see that this was a desperate cry for help. The system failed this young man and now we have hundreds of victims to show for it. So mental health professionals need to be consulted so they can express how they can have a greater impact on the actions of those who are troubled before they act out. Note: After the Isla Vista shooting in Santa Barbara a few years ago, the city formed a coalition of mental health professionals, police and others to respond to “welfare check” requests, instead of leaving it solely up to the police. If we don’t address associated mental health issues and the laws surrounding when a physician can report his or her suspicions and concerns that a person may act out, then we’ll miss the boat again. I think we all can agree, if a mental health professional says this person may resort to violence, then our first course of action should be to take away their ability to access firearms. At least, until a risk assessment is done by a professional panel. Now that the FBI is under scrutiny for its failure to follow up on what seems to be a credible tip, everyone wants to blame them. In this instance, an investigation needs to be conducted (Director Wray has already announced a probe will be conducted) and if someone needs to be held accountable, at whatever level, then so be it. But to place the blame solely on the FBI is wrong. I have high confidence that the FBI will get to the bottom of what happened and correct it. Many people will want to have officials pass legislation so that teachers and school administrators can carry weapons at school. Bringing more wood to a burning building only makes the fire grow. While on the surface, armed teacher/administrators may seem like a good idea but when you think it through it’s not. These active shooter incidents most often start outside the classroom, somewhere on the periphery. This means, that in order to be effective armed school officials would need to be outside of the classroom to engage and neutralize the threat. The tip that came in to the FBI was initiated because the behavior of the shooter was out of the ordinary. If everyone is walking around with a loaded weapon, then how do we distinguish the good guys from the bad guys? Besides, when the shooting starts who’s to say it won’t become the “wild west”? I fear there would be many more casualties. We’ve become accustomed to armed security officers or policeman because they’re uniformed, which identifies them as a good guy, and because they receive regular firearms safety training. Yet accidents do happen. I doubt teachers and administrators would receive the same degree of rigorous and routine situational training. Curious note here: A Presidential Pool reporter was stopped this morning because he had a gun in his bag and was attempting to travel with the President. If gun advocates think everyone should be allowed to “conceal carry” a weapon wherever they go, then why not let the reporter carry his legally registered firearm while accompanying the President to his golf game? Just saying. Additionally, schools are not designed for protection, they’re designed for education. Now, that said, some newer schools have been designed with security in mind but most of the effort has been on creating a perimeter that is impenetrable. The reality is, what happens if a person gets past the perimeter, then what? No places to hide that offer ballistic protection. Especially in the newer facilities with open floor plans that foster the interaction of students. The idea of stacking desks and chairs behind a door and expecting the dry-wall to offer protection from a high caliber bullet is just insane. We need a change in the way we design inhabited space, especially when the occupancy is higher than 20 people or so. There should always be two possibilities for escape. And we should be teaching to run at all costs; hiding and fighting is not an option. Throw a chair through the window, kick or punch a hole in the wall (after all it’s just dry-wall) and get out no matter what, the only time a person should stay behind is if they don’t have time to escape. With that in mind, we need to start creating ballistically protected spaces throughout that provide sanctuary and keep people safe when it’s too late for them to run. There are off-the-shelf ballistic materials available that can be used to create safe-havens, in new construction or existing facilities and can be embedded in white boards, desks and chairs. Now, don’t get me wrong, I think space exploration and figuring out a way that’s economical to get to Mars is a great and necessary thing. I’m using this as only one of many examples that I could use. I’m just saying, if we can find the money to this, then why can’t we find the money and willpower to protect our schools. The fiscal conservatives will say that it will drive the budget up. So! I can’t think of a better return on investment. The cost to launch the Falcon Heavy was somewhere close to $90,000,000. Not to mention the costs of the R&D that came before hand. There’s not alot of information about how much money is has been allocated to this program so I’m going to make some guesses here. Let’s say there were 10 launches (ground tests and orbital) at $50M each. So that’s $500,000,000. So, let’s just say, that to make a space that’s approximately 100 square feet, that can accommodate a classroom full of students and teacher, we use the occupied floorspace guidance provided by DHS for saferooms/shelter (spaces where a person can seek shelter for up to two hours) costs, $20,000. If, you divide half a billion by $20k that’s 25,000 classrooms that could be built or retrofitted. And let’s say on average a classroom has 20 students then that’s roughly 500,000 students and teachers that would have been afforded protection in the same period. Using the same formula and using just the latest launch cost of $90M, equates to protecting 90,000 lives. This doesn’t look like rocket science to me. For real change to occur two actions are required. First, we need to stop thinking about this as a singular issue to resolve. This is a multi-layered issue and can only be resolved with a multi-dimensional approach. No topic or option, no matter how painful, needs to be off the table. Folks need to check their emotions at the door and get to work. And second, and much more importantly, we need to change our way of thinking. We need to think that although it didn’t happen in my town or to my family it did happen to me personally – these are not someone else’s kids and teachers, they are OUR kids and teachers – they belong to America! We claim to be the greatest nation in the history of the earth yet we sure aren’t acting like it. 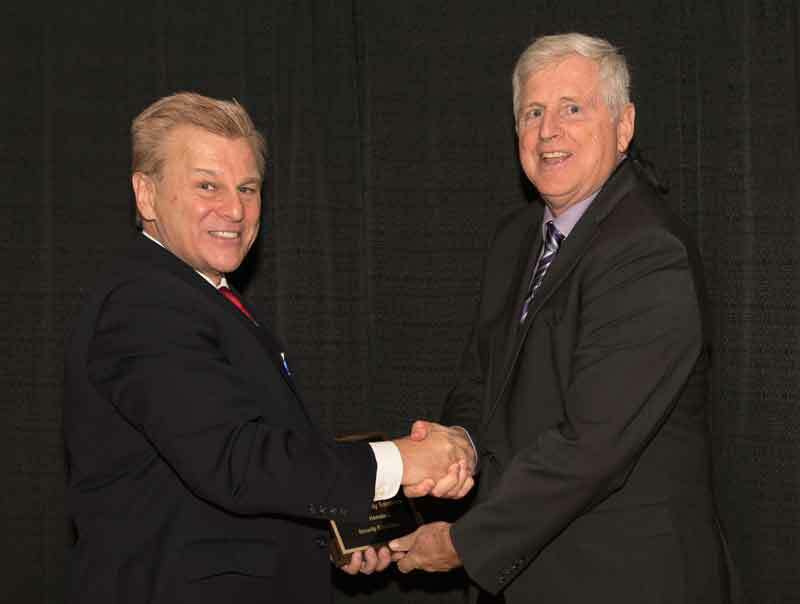 Doug Haines, owner and CEO of Haines Security Solutions has been recognized for ‘Excellence in Homeland Security’ in the 2017 ‘ASTORS’ Homeland Security Awards Program at ISC East, which was held in the Jacob Javits Convention Center on November 15th. Additionally, Haines Security Solutions Physical Security Engineering Training & Certification, took the Platinum ‘ASTORS’ Award Winner for Best Homeland Security Education. Doug is a United States Air Force Veteran with over 45 years of Law Enforcement and Security Related Experience, and a Subject Matter Expert in Building Design Principles for Architects, Engineers, Facility Managers, Planners and Security Professionals. Doug has also been named the 2016 Sandy Jones Volunteer of the Year by the Security Industry Association (SIA) for his significant contributions to the security industry. Haines Security Solutions (HSS) specializes in conducting quantitative risk and vulnerability assessments of federal, state and local facilities worldwide and other security related consulting services. HSS also develops security criteria, conducts entry control point and security forces manpower studies, drinking water systems and critical energy infrastructure risk/vulnerability assessments, and develops, plans and conducts table-top and full scale antiterrorism, force-on-force, emergency response and disaster preparedness exercises.